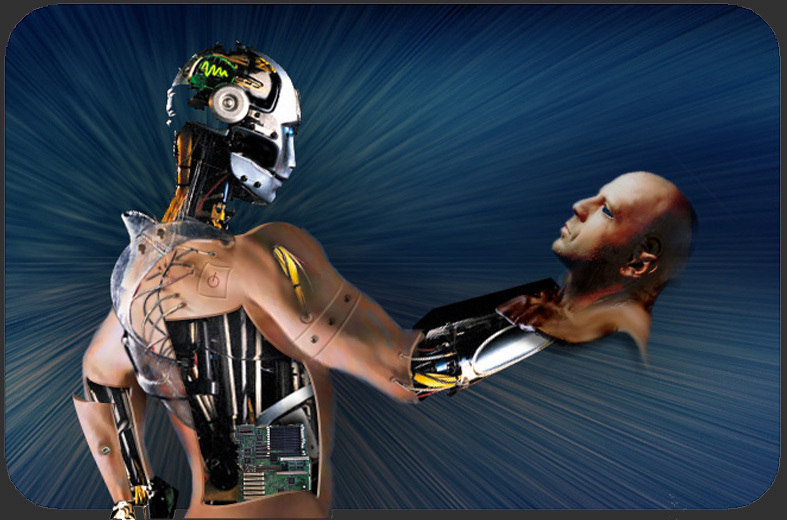 This course examines the question of whether a robot could ever become a person. In examining this question, we will consider various aspects of the relationship between minds and machines, as well as the possible criteria for personhood. In particular we will consider the question of whether the brain is a computer, whether a machine can be intelligent, conscious, creative, emotional, social, or the bearer of moral and legal rights and duties. In considering these issues, we will also take into consideration what cognitive neuroscience has learned about the minds of human and non-human animals, as well as developments in robotics and computer science. There will be several "Required" and several "Suggested" readings each week. The in-class discussion will focus on the required readings, and the suggested materials are provided for further research if you are interested in a topic, and are strongly recommended if you intend to write a paper on the topic. The weekly assignment is to write a blog entry (500-1500 words) on the course blog. Reflection questions will be given to guide you, and you can also comment on the blog entries of other students. You must post your writing to the course blog by the beginning of class on Tuesday of each week. Each post is worth 2 points if made before Tuesday's class, 1 point if made before Thursday's class, and 0 points after that. There will be 13 weekly assignments (thus 26 points possible). The remaining 4 points will be earned by commenting on the blog posts of other students. Each comment should be short (200-1000 words) and will receive 1 point. Making more than the minimum of 4 comments during the semester is strongly encouraged. Write a 5 page (Times New Roman, 12pt font, double spaced) paper on one of the topic questions, to be provided. Contribute a media project to the course blog. Such projects could include photography, video, AI interfaces or computer programs, etc. Contribute a complete wiki page to the course wiki on one of the existing topics, on another topic (get it approved please). This should include links to web resources on the topic, as well as an attempt at an authorotative definition of the topic. Design and realize a robotic project, and demonstrate it in class. Such a project could use any kind of existing, e.g. Legos Mindstorms, or custom platform. Creative projects are encouraged, but minimally your robot should sense, decide and act on its own. There will be no final exam. Instead, a 10 page (Times New Roman, 12pt font, double spaced) term paper is due on Friday May 9, 2008 at 5:00PM. If that time will not work for you, you need to make other arragnements by May 1st at the latest. Your weekly blog entries will help you develop ideas for your term paper. Your paper should be submitted to me in electronic form (Word Perfect, MS Word, PDF, HTML and plain TXT are all fine). Late papers will not be accepted, as I must turn in grades shortly thereafter. The final grade will be assigned according to a 90-80-70-60 scale, based on 100 points for the semester. Papers and projects will be assigned points scaled to their weight, thus for final papers, A's range from 40-36 points, B's from 35-32 points, C's from 31-28 points, and so on. Create an account on Wordpress. Send me your username and email for the account, along with your name as it appears on the class roster, so I can add you to the user list. Log into the blog and wiki pages for the course. Also in your email, tell me where you are from, your major, and any previous philosophy courses you have taken. Search the internet for a robot or computer program which you believe exhibits a particularly human trait and/or that you believe raises a philosophical problem. Make an entry in the course blog for Week 1, include a link to the article, website, photo or video of the robot you found, and write a short explanation of the trait and what you take to be te philosophical problem that it raises. You should post your work to the course blog. The readings listed below will be divided into "Required" and "Suggested" as each topic approaches. This list is also subject to revision based on the interests of course participants. All course reading material should be available online, either as a PDF or in some cases a link, from this webpage. Some of the video material will be shown in class, some will be available on-line, and most of the suggested films should be readily available on DVD from the library or a local rental shop. Only in one case will class participants be required to attend an event outside of class, or make other arrangements with me. Gates, B. (2007) "A Robot in Every Home: The leader of the PC revolution predicts that the next hot field will be robotics," Scientific American, January 2007. Leiber, Justin (1985) Can Animals and Machines be Persons? A Dialogue. Hackett Publishing. Rosenblueth, A., N. Wiener, and J. Bigelow (1940) "Behavior, Purpose, and Teleology", Philosophy of Science, 10, p. 18. "Folk Psychology" MIT Encyclopedia of Cognitive Science, Cambridge, MA: MIT Press, 1999. "Rational Agency" MIT Encyclopedia of Cognitive Science, Cambridge, MA: MIT Press, 1999. "Introduction: Computational Intelligence" MIT Encyclopedia of Cognitive Science, Cambridge, MA: MIT Press, 1999. "Intelligence" MIT Encyclopedia of Cognitive Science, Cambridge, MA: MIT Press, 1999. "Algorithm" MIT Encyclopedia of Cognitive Science, Cambridge, MA: MIT Press, 1999. "Computational Theory of Mind" MIT Encyclopedia of Cognitive Science, Cambridge, MA: MIT Press, 1999. McCarthy, J. (1958) "Programs With Common Sense." Proceedings of the Symposium on Mechanisation of Thought Processes, vol. 1. London: Her Majesty's Stationery Office, pp. 77-84. "Chinese Room Argument" MIT Encyclopedia of Cognitive Science, Cambridge, MA: MIT Press, 1999. Searle, J. (1980) "Minds, Brains, Programs," Behavioral and Brain Sciences, 3: 417-424. "Intentionality" MIT Encyclopedia of Cognitive Science, Cambridge, MA: MIT Press, 1999. Dreyfus, H. L. & Dreyfus, S. E. (1988) "Making a Mind Versus Modelling the Brain: Artificial Intelligence Back at a Branch-point." Daedalus, Winter 1988, 117(1), pp. 15-44. Dennett, D. (1971) "Intentional Systems," Journal of Philosophy 68: 87-106. Newell, A. (1980) "Physical Symbol Systems," Cognitive Science 2: 135-184. "Situatedness/Embodiedness" MIT Encyclopedia of Cognitive Science, Cambridge, MA: MIT Press, 1999. "Situated Cognition and Learning" MIT Encyclopedia of Cognitive Science, Cambridge, MA: MIT Press, 1999. Hutchins, E. (1995) "How a Cockpit Remembers its Speeds," Cognitive Science 19(3): 265-288. Cussins, A. (1992) "Content, Embodiment and Objectivity: The Theory of Cognitive Trails," Mind 101: 651-688. Brooks, R. A. (1991) "Intelligence without Representation," Artificial Intelligence 47: 139-159.
van Gelder, T. J. (1995) "What Might Cognition Be, If Not Computation?" Journal of Philosophy 91: 345-381. "Consciousness" MIT Encyclopedia of Cognitive Science, Cambridge, MA: MIT Press, 1999. "Pain" MIT Encyclopedia of Cognitive Science, Cambridge, MA: MIT Press, 1999. Clark, A. (2001) "Visual Experience and Motor Action: Are the Bonds Too Tight?" Philosophical Review, Oct 2001. Cotterill, R. (1997) "On the Mechanism of Consciousness," Journal of Consciousness Studies 4 (3): 231-247. Dennett, D. (2001) "Are We Explaining Consciousness Yet?" Cognition 79: 221-237. Parvizi, J. and A. Damasio (2001) "Consciousness and the Brain Stem," Cognition 79: 135-159. McCarthy, John (1999) "Making robots Conscious of their Mental States," in Stephen Muggleton (ed.) Machine Intelligence 15, Oxford University Press. Sloman, A., and R. Chrisley (2003) "Virtual Machines and Consciousness," Journal of Consciousness Studies 10 (4-5). Block, N. (2001) "Paradox and Cross Purposes in Recent Work on Consciousnees," Cognition 79: 197-219. Kanwisher, N. (2001) "Neural events and perceptual awareness," Cognition 79: 89-113. "Comparative Psychology" MIT Encyclopedia of Cognitive Science, Cambridge, MA: MIT Press, 1999. "Primate Cognition" MIT Encyclopedia of Cognitive Science, Cambridge, MA: MIT Press, 1999. Legal Rights for the Austrian Chimp, Hiasl? Arbib, M., and J. M. Fellous (2004) "Emotions: from Brain to Robot," TRENDS in Cognitive Sciences 8(12) December 2004. Fellous, J. M. (2004) "From Human Emotions to Robot Emotions," American Association for Artificial Intelligence  Spring Symposium 3/2004, Stanford University  Keynote Lecture. Rainville, P., A. Bechara, N. Naqvi, A. Damasio (2006) "Basic Emotions are Associated with Distinct Patterns of Cardiorespiratory Activity," International Journal of Psychophysiology 61 (2006) pp. 5-18. Turkle, S. (2006) "A Nascent Robotics Culture: New Complicities for Companionship," AAAI Technical Report Series, July 2006. "Self" and "Self-Knowledge" MIT Encyclopedia of Cognitive Science, Cambridge, MA: MIT Press, 1999. Damasio, A. (2003) "Feelings of Emotion and the Self," Annals of the New York Academy of Science 1001, 253-261. Hacking, Ian (2005) "The Cartesian Vision Fulfilled: Analogue Bodies and Digital Minds", Interdisciplinary Science Reviews, 30(2), pp. 153-166. Hacking, Ian (1995) "Making up People"
Sparrow, R. (2004) "The Turing Triage Test," Ethics and Information Technology 6, pp. 203213. Asaro, P. (2006) "What Should We Want from a Robot Ethic?" International Review of Information Ethics 6(12), pp. 9-16. "Ethics and Evolution" MIT Encyclopedia of Cognitive Science, Cambridge, MA: MIT Press, 1999. "Moral Psychology" MIT Encyclopedia of Cognitive Science, Cambridge, MA: MIT Press, 1999. Allen, C., G. Vamer, and J. Zinser (2000) Prolegomena to Any Future Artificial Moral Agent, Journal of Experimental and Theoretical Artificial Intelligence, 12, pp. 251-261. Asaro, P. (2007). "Robots and Responsibility from a Legal Perspective," Proceedings of the IEEE Conference on Robotics and Automation, Workshop on Roboethics, Rome, April 14, 2007. Benjamin Soskis (2005) "Man and the Machines: It's Time to Start Thinking About How We Might Grant Legal Rights to Computers." Phil McNally and Sohail Inayatullah, "The Rights of Robots: Technology, Culture and Law in the 21ST Century"
Solum, L. (1992) Legal Personhood for Artificial Intelligences, North Carolina Law Review, (April 1992), pp. 1231-1287. Coffee, J. C. (1981) No Soul to Damn: No Body to Kick: An Unscandalized Inquiry into the Problem of Corporate Punishment, Michigan Law Review, 79(3) (Jan. 1981), pp. 386-459. Arkin, R.C. (2007). Governing Lethal Behavior: Embedding Ethics in a Hybrid Deliberative/Reactive Robot Architecture, Part I. Motivation & Philsoophy, GVU Technical Report GIT-GVU-07-11, pp.1-8. Asaro, P. (2008) "How Just Could a Robot War Be?" in Philip Brey, Adam Briggle and Katinka Waelbers (eds. ), Current Issues in Computing And Philosophy, Amsterdam, Netherlands: IOS Publishers. Borenstein, J. (2008) "Ethics of Autonomous Military Robots," Studies in Ethics, Law and Technology, 2 (1), pp. 1-17. Sparrow, R. (2007). Killer Robots, Journal of Applied Philosophy, Vol. 24, No. Allen, Colin, Iva Smit, and Wendell Wallach (2005) Artificial Morality: Top-down, Bottom-up, and Hybrid Approaches, Ethics and Information Technology, 7, pp. 149-155.